Retrospective photos from the renowned 2001 Inuit film, Atanarjuat: The Fast Runner, were presented at Humber North for the first time ever during an opening reception on Thursday. The exhibition, Channel 51: Igloolik, is a celebration of 30 years of Igloolik Inuit film from the Isuma and Arnait Video Collectives. Two exhibitions are being shown at both Humber’s North and Lakeshore campuses. The objective of the exhibitions is to honour the work that has come from Igloolik, a remote community of 1,600 people in Nunavut. Humber Gallery guest curator Asinnajaq, also known as Isabella Weetaluktuk, came to Humber North to commemorate the opening of the Atanarjuat exhibition, part of the Channel 51: Igloolik Series. Her role was to curate the numerous polaroid pictures now shown in the exhibition from Isuma Productions. The Igloolik encompasses northern Baffin Island and a section of mainland Nunavut. The behind-the-scenes Polaroids include casting photos, and some taken to document costume and makeup design. Others are vaguely captioned in pen, documenting fun being had by cast and crew. Asinnajaq shared that one of the most interesting of the collection shows a mechanical walrus head that never made it into the film. She said it was supposed to be used in a scene that showed a walrus attack, but it was ultimately cut out of the film. Asinnajaq worked closely with the Aboriginal Resource Centre at Humber in hopes of engaging in a greater conversation about the importance of Indigenous art. Many students were in attendance at the opening reception, including a second-year class of Visual and Digital Arts students from Humber’s Lakeshore campus. Elizabeth Shearer said her class came to the opening in search of inspiration for its upcoming gallery exhibition project. “I like the interactive portion of it, I feel like I’m looking at a corkboard documentation of the film. It’s intimate,” Shearer said. Danica Evering, the Education Officer at Humber Galleries, worked with Asinnajaq to create an interactive component of the exhibition. 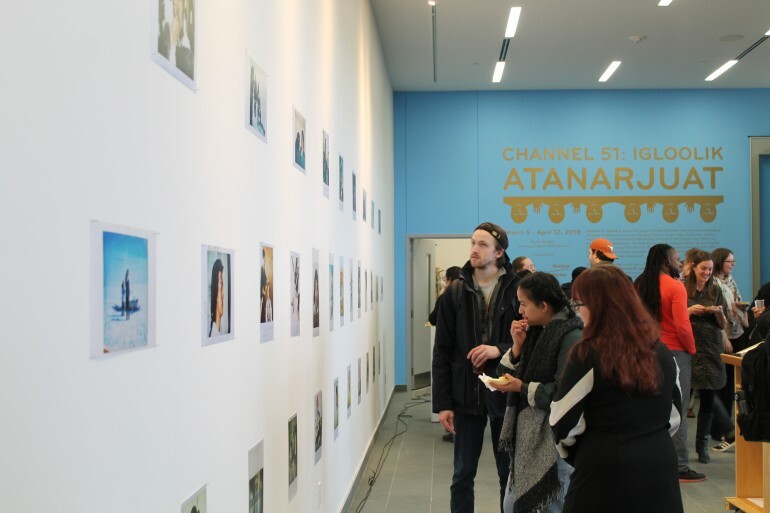 The Atanarjuat exhibiton will be open at Humber’s North Space Gallery until April 12, while its sister exhibition at Humber’s L Space Gallery will be open until April 14.